The smartphone market is growing at nearly 100% (96%). The overall market is growing at 35%. The non-smartphone market is growing at 25%. Android grew at 1,340% y/y. 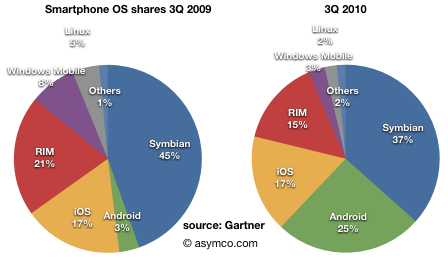 iOS grew at 92%, Symbian at 61% and RIM at 40%. Non-branded mobile phones grew to 33% of the market, with 141% unit growth. This is an alarming figure for the low-end of the market. The unbranded market excludes ZTE and Hauwei which grew below the overall market growth (9.8%, 27% respectively). 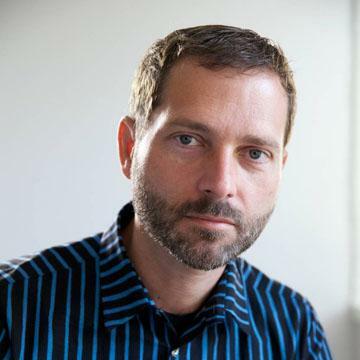 The implications were most dire for Motorola (-36% units growth), Sony Ericsson (-23%) and LG (-14%). Nokia grew but, at 3.5%, well below market growth. In 3Q 2009 41 million smartphones were sold. In 3Q 2010 80.5 million were sold. If we were to split the growth among platforms, nearly half the growth was Android. 27% of the additions were Symbian and 16% were iOS. Only 8.3% of the growth was RIM devices. 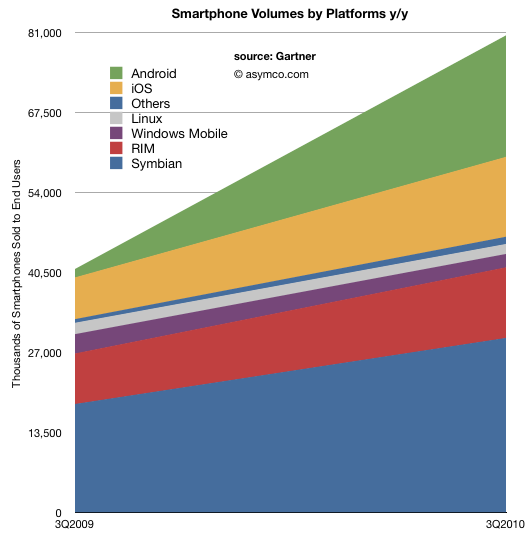 Windows Mobile and Linux were the only smartphone platforms to shrink volumes. However, even though the platform is deprecated, 2.2 million Windows Mobile devices were still sold last quarter — more than Android sold a year earlier.